Situated between two well-known Pacific Northwest culinary capitals of Portland and Seattle, it was only a matter of time before Olympia would be discovered for its innovative, locally-focused dining. Recently recognized by Food & Wine and deliciously documented on Seattle’s Fox Morning News (here, here and here) with Ellen Tailor naming the region as "the next great culinary capital," the destination continues to trend among those in the know—and now we want you to know. Taste the Olympia Farmers Market’s freshest ingredients prepared by top talent at the new food truck, Our Farmer’s Table. Located within the market, this new spot from the locally-focused Our Table restaurant sources its ingredients from market vendors like Ellis Creek Farms, Fresh Approach Fruit and Sound Fresh Clams & Oysters. The Bountiful Byway presents a tasty way to tour the region, either by bike or car. This time of year you can’t go wrong with any stop along the 60 mile scenic route, but don’t miss the spirits at Salish Sea Organic Liqueurs or Sandstone Distillery, many of which are infused with locally grown goodies. Stop for lunch for a fresh-from-the-ranch burger at Offut Lake Resort and be sure to bring your cooler for all the fresh from the farm goodies you’re sure to find along the way at the local farmers markets. Now under the watchful eye of culinary up-and-comer Austin Navarre, The Mouse Trap is a new spot for pop-up dinners, Sunday brunch and regular cheese, cider and wine tastings in addition to a selection of local and imported cheese, fine food and wine for purchase. Taste the magic of a breakfast beer at The Magnet, a morning breakfast and brunch spot from the craft power couple behind Three Magnets Brewery. 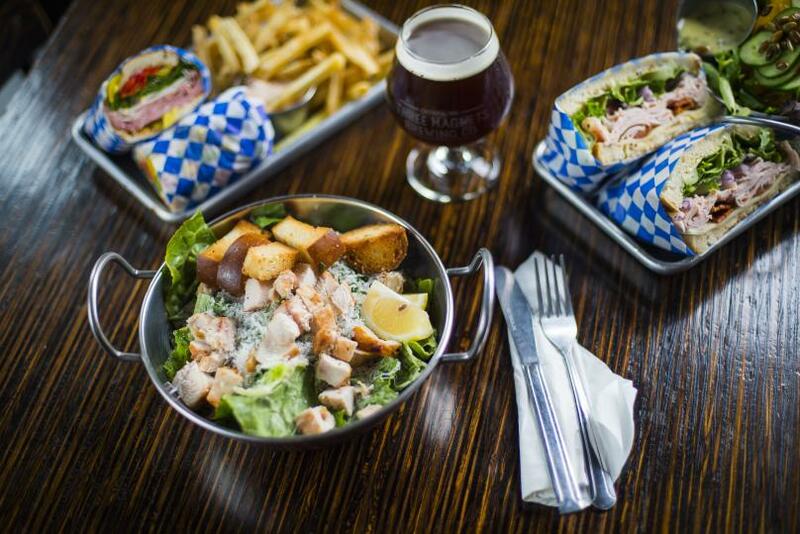 Find creative, house-made items featuring fresh ingredients, local produce and recommended beer pairings. Looking for dinner? Don’t miss the regionally-inspired pub fare found just across the hall in the brewery. Check their Facebook page for special events like seasonal releases made in partnership with local purveyors and pop-up beer dinners. Well 80 Brew Pub is honoring the region’s brewing history and embracing its future with craft beers made from the region’s famous artesian well water, with an inviting space housed in a former downtown warehouse and a delicious pub-style menu to pair with its beverages. Well 80’s brewer Paul Pearson partnered with Paul Knight, former brewer at the Olympia Brewery, for creative collaborations like the Original 64, Well 80’s take on the original Olympia Beer and the Original Dark 66, another riff on an Olympia Beer classic. This is just a small sampling of the culinary adventures available throughout the Olympia region. Show us your foodie finds! Tag social posts #DecidedlyDifferent and connect with us on Facebook, Twitter (@Experience_Oly) and Instagram (@ExperienceOly).